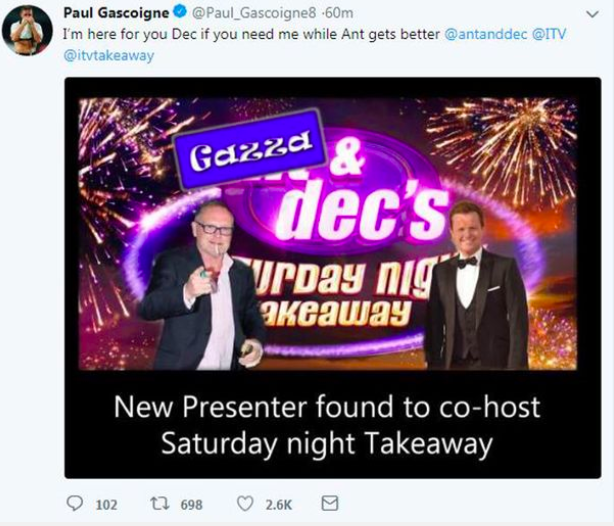 Don’t worry Dec, you may not have to present the remaining Saturday Night Takeaway shows alone, as Gazza has your back. 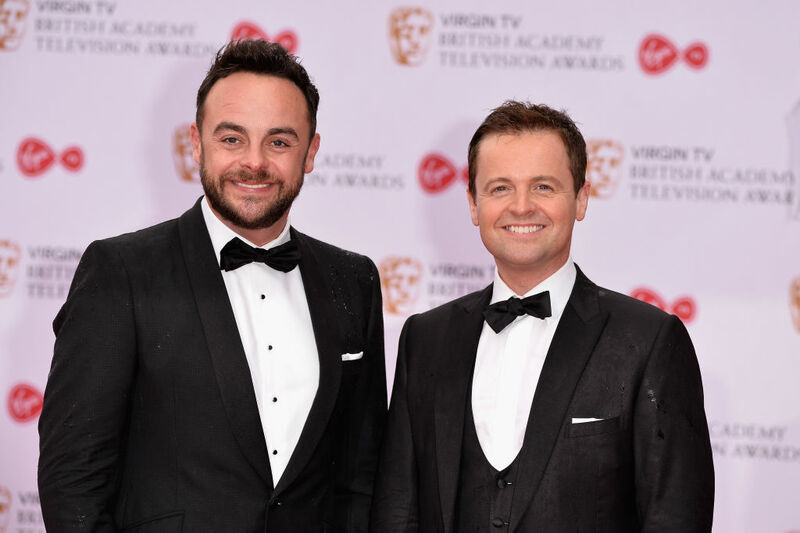 Following Ant McPartlin’s drink-driving charge last week, ITV revealed Declan Donnelly will be presenting the last two shows of the popular television programme alone. McPartlin has returned to rehab after crashing his Mini on Sunday afternoon (March 18) in south-west London. Realising Dec may need some help, former footballer and manager Paul Gascoigne has offered his hand of support. On Thursday (March 22) Gascoigne posted a Photoshopped image of himself with Dec on Twitter. 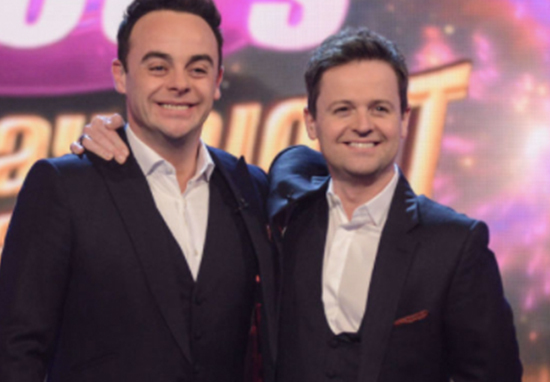 I’m here for you Dec if you need me while Ant gets better. Underneath the image was some additional text which read ‘new presenter found to co-host Saturday Night Takeaway’. 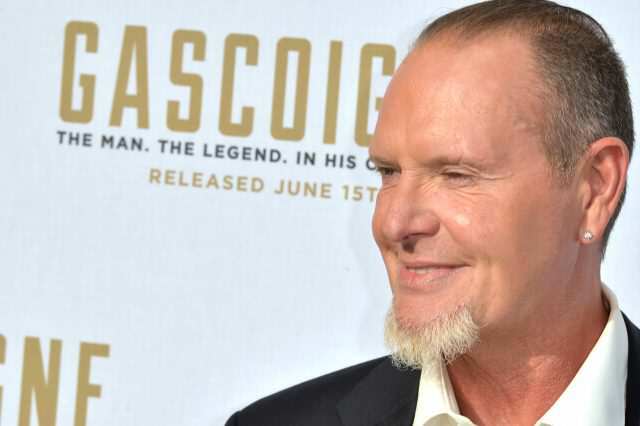 Gascoigne has also battled alcoholism in the past, especially during the later parts of his playing career and after retirement. He has gone through several rehabilitation programmes all of which only provided temporary relief. Gascigne has also suffered from severe mental health problems and has previously been sectioned, most recently in 2014. In May 2017, Gazza opened up about his struggles in an interview on Good Morning Britain. The 50-year-old revealed he was ‘doing really well’ battling his addiction issues but was struggling to stay sober after the death of his nephew Jay Kerrigan who took his own life in 2016 aged 22. I haven’t had the best of years and I was doing really well until Jay. He wasn’t in a good way… I’ve just had a terrible year. I’ve had these blips and things got the better of me. Then I had these tours and the drink got the better of me. One of the reasons Gazza is lending his hand of support then is probably because he sympathises with what McPartlin is experiencing. The I’m A Celeb presenter checked himself into rehab for the first time in June 2017 after battling with drink and drug addictions. 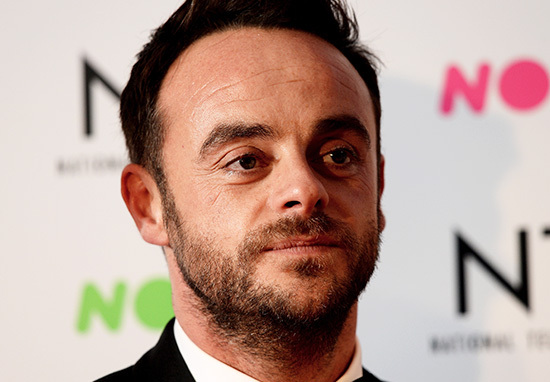 Following the announcement of his divorce from wife Lisa Armstrong earlier this year, Ant was charged with drink-driving after a crash involving two cars reportedly injured a young girl of just three years old. The little girl was taken to hospital as a precaution after the 42-year-old presenter lost control of his Mini with his mum inside. The TV host will now appear at Wimbledon Magistrates’ Court on April 4.